Do you use interactive TV features? Do you use interactive features like the red button, teletext, etc, or do you just use it to watch shows? No. I know we had Teletext about fifteen or twenty years ago but I don't know if it still exists in Australia. I don't know anyone who uses it. 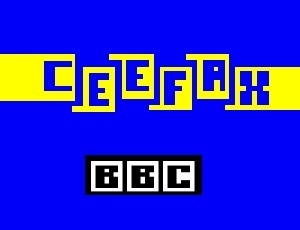 Ceefax in Britain closed down a couple of years ago, but I think there is still another form of teletext that we get available via the red button. No. I watch T.V. to watch, not to interact. Besides, it sounds complicated. No. I just watch TV. If I want to interact, I hop on my computer! Who is the best sitcom writer? Which is your favourite Pokemon character? Can you answer any of the University Challenge Questions? WIill you be watching JK Rowling's small screen debut? Who is your favourite animator?